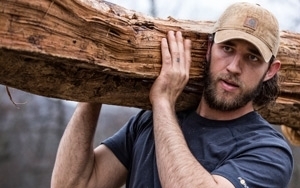 San Francisco Giants Pitcher Madison Bumgarner has a prominent role in a Carhartt workgear campaign breaking April 5. The 25-year-old North Carolina native, who was named MVP of the 2014 World Series, takes care of a ranch in his hometown of Lenoir in the offseason. The production crew simply followed Bumgarner around his home doing chores to get footage for the spot, which also features men in other professions who wear Carhartt. Bumgarner was a natural fit because he grew up wearing the Carhartt brand, says Tony Ambroza, senior vice president of marketing at Dearborn, Mich.-based Carhartt. The spots show that before there were “workouts,” there was just “work.” Men who wear Carhartt don’t need to take spin classes, according to a line in the 60-second TV spot, which shows a quick cut of a man pedaling a stationary bike furiously before cutting back to “real” men getting a “real” workout, including Bumgarner cutting down a tree and casually walking away as it falls. The national campaign, which features Carhartt’s sweat-wicking Force apparel, will run across multiple media platforms including TV, digital, mobile and thousands of retail stores. Carhartt has always featured real people doing real work in its marketing efforts. In addition to Bumgarner, the campaign features firefighters from Creede, Col., search and rescue personnel, construction workers from Detroit, electric utility workers, farmers and railroad workers. The brand has had an informal relationship with Bumgarner for several years, Ambroza says. This is Momoa’s directorial debut for a commercial and Carhartt also plans to have him direct its fall 2015 commercial. Bumgarner could return in the future as well.